Welcome to Facing Web's website portfolio. Here we showcase websites in a few different categories which reflect our design and SEO tactics, helping bring into focus a powerful online presence. Facing Web’s services are tailored to specific needs of any person, proprietor, or large entity. We provide web development for a variety of online demands, such as featured business websites, blogging websites, personal, and eCommerce design. We also offer logo design, hosting, maintenance, online marketing, proven SEO tactics, website security, and a lot more for a one-stop solution to your online presence. Facing Web’s featured websites, we believe, speak for themselves. We offer modern, quality design with top SEO tactics which reflect your business and your voice. Knowing how important it is to stand out we strive for elegance and focus. Logo and branding design are essential to building the right voice to speak to the your targeted audience. We know how important it is to be recognized and communicate a strong visual image to be remembered. Our logo design and identity team have the ability to bring you a design which resonates with your audience and separates you from the competition. We can provide your business all the essentials from business cards to letterheads, e-signatures, signage, marketing banners, and more. Whether you have one product, hundreds, or thousands, Facing Web can bring your product(s) to the masses. Our team studies your business and growth patterns to ensure your site is able to scale with your budding business. When it comes to ranking well in the biggest search engines, content is king. Which is why we implement blogging strategies into our clients businesses. We provide a custom blog design integrated into your website making your business a stand-out authority. Don’t have time to make blog content? No problem. We offer a variety of subscription plans to make sure your online presence stays thriving while you have to freedom to run your business. We aim to give consumers a comfortable place to stay up-to-date with your business. Whether on social media or via search engines, we will make sure you're visible and convert traffic into customers. Sandlot Homes is a real estate investment company based out of Encino, Ca. 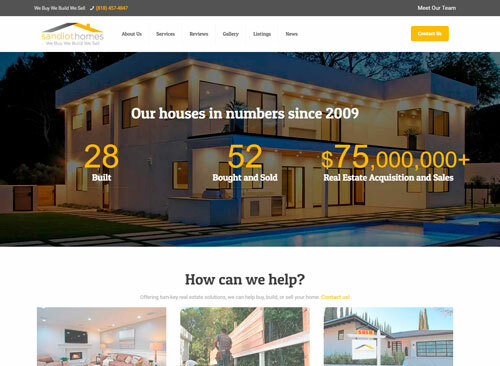 As a brokerage and construction company, the goal of sandlothomes.com was to incorperate the MLS datebase as well as showcase the revitalized properties remodeled by Sandlot Homes. Partnered with Facing Web, Sandlot Homes has our full branding and digital marketing package. Contact us for more info. Head West, Inc came to Facing Web for a modern take on a timeless business. 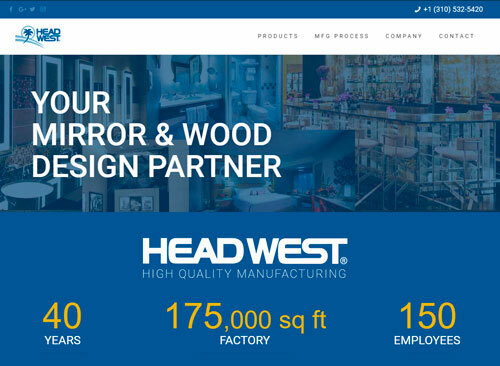 As a design partner to hospitality and home improvement stores, Head West, Inc prides themeselves on craftsmanship and customer service. Taking aim at showcasing quality and experience, Facing Web captured a 175,000 sqft factory and 40 years of excellence. Opening a Wellness Center, Dr. Ford needed to a place for patients to come and learn about the treatments offered. 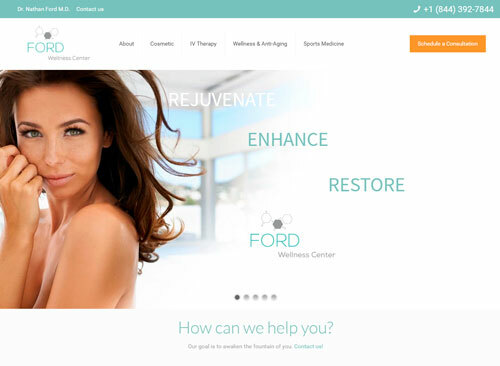 With the ability to make appointment from the website, fordwellnesscenter.com offers a solution for a medical practice. Secret Model Beauty is a magazine/newspaper website bringing beauty tips from professional models to the masses. The goal was to have the ability to sell products, collect reader email addresses, easily update content, and keep a beautifully modern website. In progress, texas-holdem-strategy.com offers in-depth articles, tips, and news on texas holdem poker strategy. 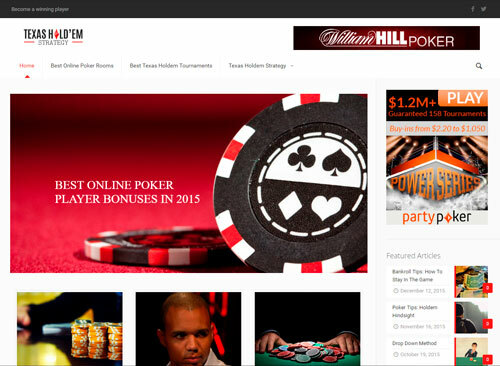 The catalog will reach more than 1,000+ articles and will soon feature a custom texas holdem game app. 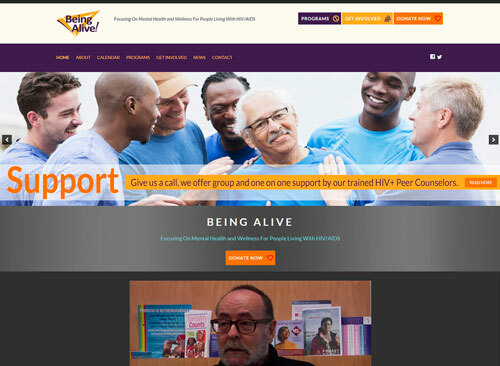 Being Alive is a non-profit organization focusing on the health and well-being of those infected with HIV and AIDS. Based out of Los Angeles, they came to us, not only to modernize their website but also bring their SEO up the ranks. We have hit our goals and Being Alive is seeing 35% increase in new members as well as donations. 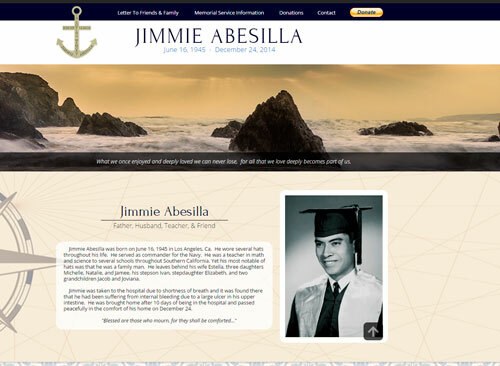 The Jimmy Abesilla memorial website was commissioned by the family to share their beloved Jimmy's memory. The goal of this page was to help the family with donations for services, share memorial information, and pay tribute to one of our US Navy Commanders. We are honored to have been a part of this project. Whether you are a sole practitioner or a large company, Facing Web will customize SEO and marketing strategies to fit your needs.